Los Angeles is a great place, but everyone has days when the traffic is too much and all the sprawl begins to feel oppressive. When that happens, we recommend packing up the car—or hopping on the train—and heading to some of these small towns within just a few hours of the city. From quaint beachside communities to artist retreats to truly off-the-grid communities, Southern California is filled with all kinds of towns to explore on a long weekend or strategically planned sick day. Below are more than a dozen options for when you feel like leaving city life behind for a while. With a combination of quality wine, mission-style architecture, and a legion of spas and health resorts, Ojai has everything one could want from a small town retreat from city life. Take a hike. Read a book. Meditate. 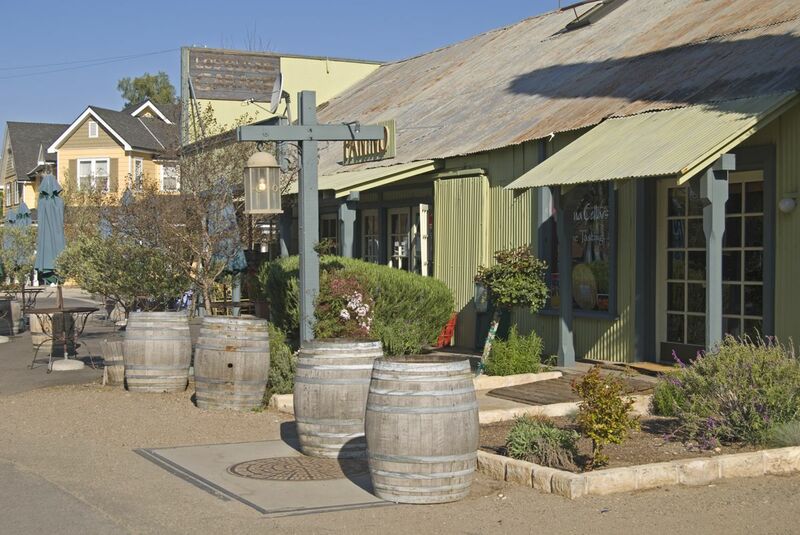 Ojai has long been the place Southern Californians go to relax. An entire town devoted to the Danish heritage of its founders, Solvang can feel a bit like another country—or maybe Disneyland. The streets are lined with colorful Scandinavian-style buildings and replicas of notable monuments and sculptures found in Copenhagen. There’s also plenty of Danish food to be found, including the aebleskiver for which the town is famous. The dish consists of pancake-like pastries smothered in jam and powdered sugar. Perched high in the San Gabriel Mountains, Wrightwood is the kind of town that looks like it belongs in a snow globe. And less than 90 minutes from Los Angeles (weather permitting), it’s one of the closest towns where Angelenos can go to play in the powder. With a population well over 100,000, many wouldn’t consider Orange a small town in the conventional sense—but it certainly has that small town feel. One of the most popular places in the OC for both dining and antiquing, it’s also home to just over half of all houses designed by midcentury master Joseph Eichler. The resort community of Avalon, located on Catalina Island, can only be accessed by airplane or boat. Once there, you can shop, snorkel, or just sit back and enjoy the sea breeze. There’s plenty to do in this pretty seaside town north of San Luis Obispo, including kayaking, biking, and eating (fish and chips, anyone?). Take a stroll through the kitschy shops and grab some saltwater taffy and a postcard. Of course, the main attraction is the striking—and very photogenic—576-foot rock that rises majestically from the bay. Just don’t try to climb it without a proper permit. It will not go well. The seaside community of Carpinteria manages to combine beautiful beaches with an unpretentious small-town vibe that’s sometimes hard to find in Southern California. A great place to hang out and watch the waves, the town is also home to the popular Island Brewing Company and an annual avocado festival in October. It’s also got a stop on Amtrak’s Pacific Surfliner route, so you can leave the car behind. Look, quiet beach communities are one thing, but if you’re really looking to get lost, Slab City is the place for you. The site of a former Marine Corps base, it’s now occupied by a colorful cast of squatters and nomads. There’s not much in the way of services, but over the years a library and makeshift performance spaces have popped up. The community is best known for its incredible works of outsider art, including the striking acrylic paint monument known as Salvation Mountain. A former gold mining outpost, Kernville is now one of California’s finest spots for biking, hiking, rafting, camping, and a host of other activities. The town itself is worth a visit for its rustic charm and stunning natural surroundings. Learn a thing or two about its history at the Kern Valley Museum. This small oceanfront community north of San Diego offers plenty of shops and restaurants, along with frequent live music performances. The real draw, however, is the beach, speckled with tide pools and overlooked by majestic bluffs. Like Carpinteria, the town is conveniently accessible by Amtrak. Nestled in the San Jacinto Mountains above the desert communities of Riverside County, Idyllwild is known for its natural beauty and thriving artistic community. The unincorporated community features miles of hiking trails and rock faces popular with climbers. There’s also an annual film festival in the winter and a popular jazz festival in the summer. Fun fact: Idyllwild is home to Frank Gehry’s very first project: the little-known David Cabin. This desert town is, of course, known for the national park by the same name. But downtown Joshua Tree offers numerous art galleries, restaurants, and vintage motels. As an added bonus, you’ll find plenty of roadside oddities along the way. Another mountain town, Lake Arrowhead is about as tourist-y as they come. But that’s not always a bad thing. The small community in the San Bernardino Mountains offers terrific skiing in the winter months, lakeside recreation in the summer months, and a seemingly endless array of festivals and events all year round. Highlights include the huge Oktoberfestin fall, a summer concert series, the Blue Jay Jazz Festival, and the popular antique and wooden boat show in June. Who doesn’t love antique boats? Historic San Juan Capistrano, the romantic setting for the first of Johnston McCulley’s Zorro stories, is a must-see for history buffs and architecture lovers alike. Its oldest structure is the Great Stone Church, constructed between 1797 and 1806 and partially destroyed by earthquake in 1812. Also of note are the 31 historic structures of the Los Rios District, along with Michael Graves’s postmodern library building. 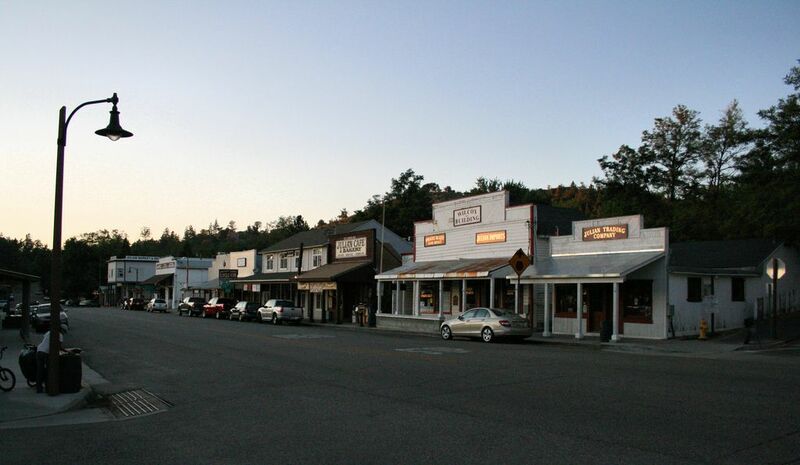 An old gold mining town up in the Cuyamaca Mountains, Julian has carefully preserved its old west aesthetic over the years. The town is perhaps most famous for its apples, which apparently took first prize at World’s Fairs in Chicago, Saint Louis, and San Francisco. Every September, Julian holds its Apple Days festival featuring apple pie, cider, and plenty of other apple-related things. Looking for something a little less quaint? Perhaps a visit to the apocalyptic landscape of the Salton Sea will be more to your liking. Once a popular resort community, flooding and a series of environmental calamities have devastated the town—and others alongside the sea. Now, a trip down Yacht Club Drive brings you to a long row of decapitated palm trees and a view of the shoreline, littered with the skeletons of dead fish. (Pretty scenic, eh?) And while it might seem like the end of the world out here, there’s actually a few places to stay including several motels and campgrounds. 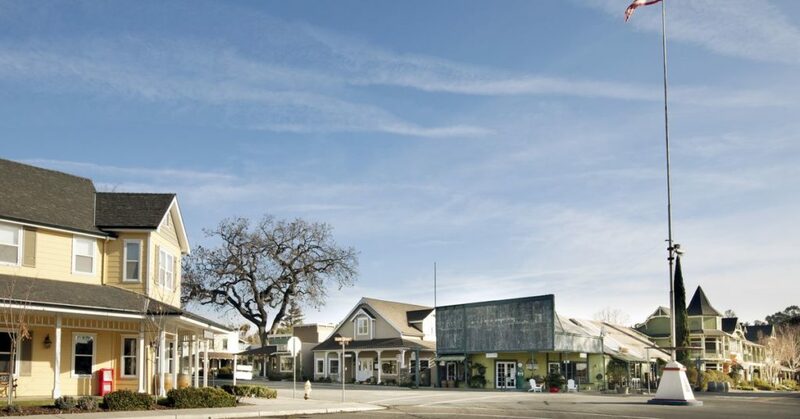 This Santa Barbara County cowboy town has been around since the 1880s, and many of the buildings in its Old Town area were constructed around that time or shortly after. The historic facades along Sagunto Street offer a bit of nostalgia, while copious wineries and horse ranches offer plenty of activities for visitors. The area is also a popular spot for bicyclists, with miles of winding country roads. Accessible to great hiking opportunities in Cleveland National Forest, Alpine offers a laid back, woodsy atmosphere just 30 miles from San Diego. The town has homey restaurants and a brewery, but its main attraction might be the big cats you can see and learn about at the nearby Lions, Tigers, and Bears animal rescue center, where exotic animals formerly kept as pets are rehabilitated.